Collier-Scripps Hall, which opened on Drake’s campus in fall 2017, houses the Department of Mathematics and Computer Science, the School of Education, and the Robert D. and Billie Ray Center. 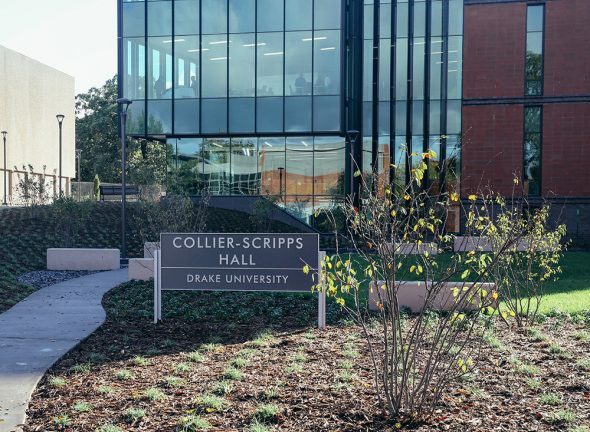 A new academic concentration at Drake University challenges students to examine the complex relationship between science and the humanities. Launched in spring 2018, the Interdisciplinary Study of the Humanities and Sciences will be taught by faculty members from numerous academic disciplines, including English, philosophy, chemistry, and sociology. What can be learned about a piece of art by studying its chemistry? Does a ‘big data’ approach to business and politics threaten to diminish our humanity and individual privacy? How has our understanding of the human brain influenced filmmaking? These questions are of increasing importance as science and technology continue to have expanding roles in our personal lives, our political and social spheres, and our business interactions, said Associate Professor of Philosophy Martin Roth, who recently published a book about neuroscience’s influence on criminal law.